With so many accessible glaciers near Anchorage, there are naturally many ways to enjoy them. Time with glaciers means incredible sights, amazing adventures, and memories to last a lifetime. Combine some of the best glaciers in Alaska on this three-day trip. You’ll find ice is nice from all angles. Enjoy the scenic, self-guided drive along Turnagain Arm, or arrange motorcoach transport through your day cruise provider. The white spots you see in the water on the trip to Whittier probably aren’t icebergs. Beluga whales swim in the waters of Turnagain Arm. They hug the coastline as they search for fish. Scenic spots along the highway are perfect for a little impromptu whale watching on the way. Head for Prince William Sound and its countless tidewater glaciers. Travel through one of the longest vehicle tunnels in the country, Anton Anderson Memorial Tunnel, on the way to Whittier. Cast off from Whittier harbor for an amazing day of glacier views. College Fjord, Harriman Fjord and Blackstone Bay are each loaded with glaciers. When the captain cuts the engine, the boat goes silent. The only thing you’ll hear is the cracking of ice, punctuated by the rumble of calving ice tumbling into the water below. Glaciers aren’t the only draw; this is a popular spot for sightings of eagles, whales, sea birds, otters and seals as well. While you keep a sharp eye out for wildlife, enjoy lunch aboard the ship. Margaritas served with glacier ice collected during the voyage are a popular drink for those of age. Return to port and set course for Girdwood. This mountain town south of Anchorage is ringed by mountains filled with glaciers. The Alyeska Tramway is one of the best ways to get a better view. It’s also the way up the mountain to Seven Glaciers, one of the state’s finest restaurants. Panoramic windows look out across the valley to seven named glaciers. Before the appetizers arrive, you’ll understand why some still call Girdwood “Glacier City.” Overnight in Girdwood. Hop aboard the Glacier Discovery train when it stops in Girdwood. You’ll spot more hanging glaciers in the mountains south of Girdwood. The views are just a sample of what’s in store today. The Alaska Railroad makes a special stop just for glacier adventurers. Step off at the whistle stop in Chugach National Forest for a date with Spencer Glacier. The train pulls away, and you have Spencer Glacier all to yourself. Book a kayaking/ice hiking combo with Ascending Path or raft the Placer River with Chugach Adventures. You’ll paddle through the ‘bergs floating calmly across Spencer Lake, enjoying a view few ever get. Board the train and head back to Anchorage. Way back when, dog sleds were the perfect way to bridge vast distances in Alaska. Aviation took its place in the early 20th century. Why not combine both, and add one more glacier to the mix? When snow retreats to the mountains in the spring, so do many mushers and their dog teams. Dog sledding in summer often takes advantage of the snow and ice atop nearby glaciers. Climb into a sporty helicopter at Merrill Field and take off for a visit. 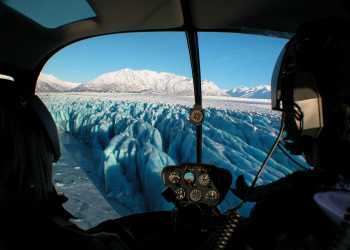 You’ll spy plenty of glaciers nestled in the Chugach Mountains before setting down atop Knik Glacier to meet the team. Cuddly puppies melt hearts. Chilling out with their excited, eager parents will get you sliding across the snow. This is the speed and sport of the Iditarod. Spa(aah)…relax with a massage or facial. Many local spas offer glacial mud treatments. The fine, silky sediment from glacial riverbanks is perfect for the skin. Once the mud comes off your face, here’s mud in your eye! Find a secluded spot to celebrate three days of nice ice. Anchorage bars and pubs offer a different kind of cool, one perfect for unwinding after adventures.